A Tribute to Anthony Burgess in his Centenary Year. Jane McChrystal. Now best-known for writing the novel A Clockwork Orange, which Stanley Kubrick turned into the ultra-violent film of 1971, Anthony Burgess died on 22nd November 1993. He was the author of thirty three novels, twenty five works of non-fiction, two autobiographies and countless reviews and articles, notably for the Yorkshire Post and the Observer. As a composer he produced three symphonies and another 250 musical works. He was a writer of libretti and film and television scripts. His studies of philology earned him a gig as the inventor of a proto Indo European language to be spoken by the Palaeolithic protagonists of Jean Jacques Annaud’s Quest for Fire. He was also a misogynist, liar and braggart, who wrote opinion pieces for the Daily Mail in later life where he cultivated the persona of professional curmudgeon. For all that, he retained a number of credible admirers including William Boyd, Gore Vidal, Harold Bloom and A S Byatt. For my part, the accidental discovery of his collected journalism Urgent Copy in 1975, revealed all sorts of things which weren’t on the A level syllabus at that time: modernism, Jewish American literature, Linguistics. Articles on Joyce, Nabokov, Mallamud, Steiner and Levi-Strauss opened up new worlds of cultural possibility to a bored pupil stranded in the sixth form of a rather utilitarian, suburban grammar school. I went on to the first three Enderby* novels about a seedy poet, obsessed with his bowels, who is stuck on the south coast in a state of arrested development until he forms an improbable marriage with the glamourous editor of a women’s magazine and is catapulted into a series of picaresque adventures, which usually end in humiliation, defeat or worse. As well as drawing on a recondite vocabulary – cat-nip to a pretentious adolescent in search of verbal thrills – Burgess conjured with words. Take this example from Enderby Outside. Enderby, forced to take on a temporary role as a bar tender named Hogg in a London hotel, is serving drinks when …instead of expensive mouthwash he (a customer) had breathed on Hogg-Enderby, bafflingly (for no banquet would serve, because of the known redolence of onions, onions) onions. ‘Onions,’ said Hogg. He was frowned at in puzzlement. “Cocktail onions”, he offered. It’s true that my adult tastes haven’t really kept up with the high tone set by Burgess’s criticism, but I’ll always be grateful for his introduction to a cultural landscape richer than anything offered by my formal education. Why, then, is he hated with a passion that amounts to obsession in some quarters? A grammar school-educated graduate of Manchester University, brought up as a Roman Catholic by a tobacconist and pub landlady, he was never going to slip all that easily into the establishment of mid-twentieth Century literary London. In many ways he was an un-English artist. He embraced modernism as a critic, author and composer. He was not afraid to tackle big questions: free will versus determinism, the potential for art to corrupt and the role of the state in moulding the individual. He was open to other cultures and languages. As a teacher in 1950’s Malaysia, he learned the language and mixed with Malaysians rather than sticking with local ex-patriot community. In the1970’s he lived in Bracciano for four years and became fluent enough in Italian to write regularly for Corriere della Sera. His writing was of its time and certainly would not meet any standards of political correctness which we apply, quite correctly, today. 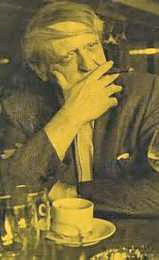 However, the cosmopolitanism and intellectualism of his work distinguish him from literary contemporaries, such as Kingsley Amis, who tended to despise displays of cleverness or learning and limit their explorations of life to the campus or certain post-codes within the London borough of Camden. It was the afternoon of my eighty-first birthday and I was in bed with my catamite when Ali announced that the Archbishop had come to see me. *The Complete Enderby, 2002, Vintage Classics. ** Geoffrey Grigson, another well-known detractor, recorded Disraeli’s description of Gladstone as applied to Burgess.